Anyone who thinks AI won’t be able to write literature that’s as good as anything a human can produce within a couple of decades is deluding themselves. That was ALLi’s Dan Holloway over Christmas on the ALLi site, but I’ve deliberately kept the quote until today because it is one best suited to open the New Year with rather than say goodbye to the old. Those who follow my ramblings elsewhere will know I’ve been warning for a few years now that we are fast approaching the point where a “machine” will not only write a book every bit as a good as the average human-produced book now, but will also edit it, proof it, format it for digital and print, publish it and start the marketing campaign, all in the time it took you to read that sentence. And before you take you next breath it will have recorded the audio-book, translated the book into every worthwhile language, and be halfway through the sequel. No, it won’t be Shakespeare, but it will be addictively readable. Addictively? Because AI will not just write the book but will follow every reader’s level of interest and work out what kept those pages turning so it can do it again. But here’s the thing: the AI writing revolution is likely to be led by the retailers. Or at least, one in particular. And actually, Amazon is already halfway there. For a year or two now the Jeff Bezos owned Washington Post has been happily using bots to publish news content that few would know has been untouched by human hands. 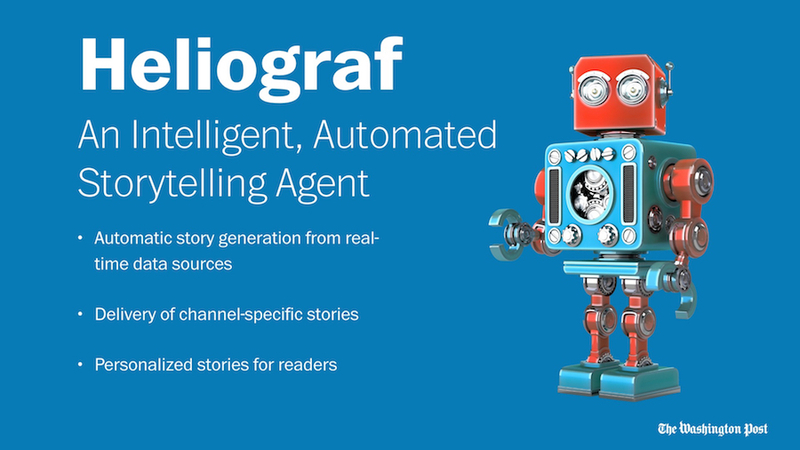 Digiday reported in September 2017 that the Washington Post’s AI software Heliograf had published 850 stories (news stories, not fiction) in the previous twelve months. In the second quarter, The Patriots’ Paul Dalzell was the first to put points on the board with a two-yard touchdown reception off a pass from quarterback William Porter. Wilson was behind Yorktown 7-0 heading into the second half. Wilson’s Anton Reed tied the score with a two-yard touchdown run. The Patriots took the lead from Wilson with a two-yard touchdown run by Tanner Wall. The Patriots scored again on Adam Luncher’s 29-yard field goal. Yorktown maintained their lead going into the fourth quarter, 17-7. The Patriots extended their lead over the Tigers on Luncher’s 27-yard field goal. Wilson cut into the Patriots’ lead with a three-yard touchdown run by Amir Gerald. The game ended with Yorktown defeating Wilson, 20-14. And there’s more. Find the original here. Now I have no idea if that qualifies as good sports reporting, and it won’t win the Pulitzer prize any time soon, but on the other hand it’s respectable newspaper English and as good as much that is churned out by humans every day. But Bezos is not just using AI to write content, but also to read it out loud, in a very human voice. Polly is Amazon’s text-to-speech software, already phenomenal, and getting better every day. As per the Geekwire quote above, it’s already working with 24 languages, and more will surely follow. You may never have heard of Amazon Polly, but chances are you’ve already heard Amazon Polly in action, and never knew you were listening to a machine talking, not a real person. Check out the Amazon AWS Polly video here. UPDATE February 2018: There is now an Amazon Polly plug-in for WordPress. Amazon is not the only player in this field, of course, but the very fact that Amazon is in this field at all should at once delight and mortify us content creators. Because where I disagree with Dan Holloway’s opening quote is with the “couple of decades” timescale Dan envisages. I don’t think we have anywhere near that sort of leeway, and that as soon the 2020s we are going to see a tsunami of bot-produced and bot-managed content that will make the disruption of the “ebook revolution” look like a mild ruffle of publishing’s feathers. Almost two years ago now a Japanese bot wrote a short story that almost won a literature prize. In August of last year in South Africa AI was being used to predict and write the next Game of Thrones in the style of George R.R. Martin. Not the official GoT, of course, but a worryingly passable rendition. Halloween 2017 found Shelly.AI offering bot-written horror stories. Some progressive authors, Joanna Penn among them, are exploring AI, and that’s the sensible approach right now. Fantastic opportunities ahead for indie authors and publishers big and small that will embrace the opportunities unfolding. But also dark times ahead for those who think they can just carry on regardless, and dark times ahead for new authors coming to the market with no history, trying to be discovered in the ocean of bot-produced content we’ll soon all be swimming in. Beware the future. It’s not just closer than you think. It’s racing up behind you like an out of control locomotive on steroids. There was a 1974 French graphic novel (Les Mange-bitume, Dargaud, Lob/Bielsa) that had the AI-written stories revised by a human who added his “personel touch”.